Meredith is hitting the bottle pretty hard at Joe's, nervously awaiting a final decision from Derek, who she begged to pick, choose and love her in the previous episode. Just as she reaches the point of desperation, the interns are all called to SGH after a train derails. Upon arriving at the hospital, Meredith must sit back and observe (while hooked up to an IV to sober her up) while the other interns go to work. The carnage of the crash is massive. Cristina embarks on a mission to find the severed leg of an injured man Dr. Webber is operating on. She first brings him a second left foot, then a female foot. Eventually, the leg is discovered by Alex, who assists Dr. Webber in the surgery and rediscovers his mojo. Whatever that means. Meanwhile, Addison sees great potential in Izzie, who must decide whether her loyalty as Meredithâ€™s friend outweighs her professional aspirations. Most notably, we are introduced to Tom and Bonnie, a pair of passengers impaled by a metal pole. Severe as their injuries are, the pole is actually plugging their wounds and keeping them alive. One of the two will have to be slid off of it for any surgery to be performed, and that process will probably lead to the death of whoever is chosen. Because Bonnie's injuries are worse than Tom's, she is the one chosen to be removed from the pole. 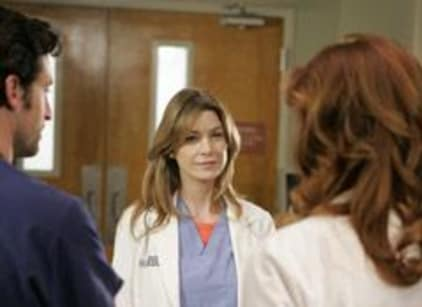 Dr. Burke and Dr. Shepherd work on her only briefly before determining her situation is hopeless and turn their attention to Tom, who has a greater chance of living. As the doctors leave Bonnie, Meredith loses it, standing over the dying Bonnie, crying "What about her? We can't just abandon her!" Symbolically, the scene represents her own life, as she realizes Derek has decided to remain with Addison.